Why would they be astounded? Yet in the meantime, this Probiotic Potato Salad packs a nutritious punch, and picky eaters are none the wiser. 😉 If you use my homemade seasoning salt, you’ll be adding the superfood kelp to your diet, a wonderful source of minerals. Season kefir (or yogurt) to taste by slowly whisking in homemade herb seasoning salt (or Herbamare). Whisk in 1 tablespoon of pickle juice or lemon juice at a time to the herbed kefir. Think thin salad dressing consistency. Chill. Any leftovers make a great dip for veggies! Then, in salty water, boil (or roast) 12 medium potatoes until soft. I don't bother skinning them. The skin scrapes off easily when cooked if desired. Drain and cool. If you wish, hard boil eggs as well. Peel and cool. Once cooled, dice potatoes and eggs. Combine in a mixing bowl. Chop onions, celery, olives, and any other veggies. Add to the bowl. Add herbed kefir dressing and toss lightly. Don't mash the potatoes or eggs! Add other ingredients to taste — such as parsley, dill, garlic, and salt. Chill until ready to serve. Wait at least 2 hours so flavors have time to mingle. Enjoy! Does your family like kefir? 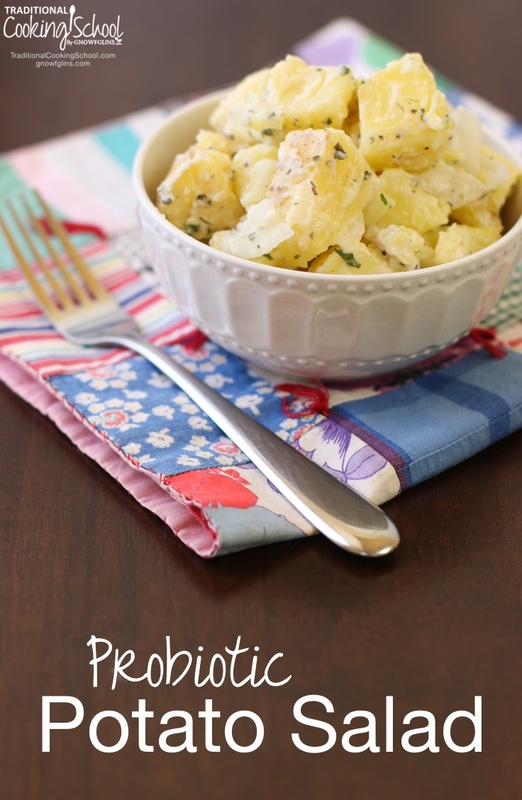 Do you think they will enjoy this Probiotic Potato Salad? This sounds so delicious. Great photos! Putting this on my make it list. .-= Pamela´s last blog post… Zukay Fermented Salad Dressings……. =-. Pamela, Thank you! I hope you will like it! I worry about leaving food out in this heat. (105 here and 95 inside) Is it ok? Also even soaking beans or grains in this weather. Is it safe? Linda – I worry about it too. This morning, I’ve got a batch of cheese that is worrying me, so I moved it to the fridge (it was out). Our house is about 90 degrees in the evening the past few days. When I made this potato salad, our house temp was in the high 70s. Here are some things I would do if I were going to make in our current high temps. I would salt (to taste) the kefir or yogurt before putting it in the cheesecloth – salt will suppress putrefying bacteria, as will the whey that is naturally present in the kefir/yogurt. If any of it started spoiling, it would be the kefir/yogurt that are at the edges of the glob in the cheesecloth. Those bits can be scraped off and the main glob left alone. I would smell it frequently and consider moving it to the fridge if it began smelling off. It can’t hang it in the fridge. But hanging isn’t essential. My mom always made yogurt cheese by putting the yogurt in a pillow case, in a colander, over a pot/bowl. She’d twist up the top of the pillowcase and come back and do that off and on, encouraging the whey to drip out. The pillowcase was never hung. So this setup could be moved to the fridge if you’re worried. As for the grains and beans, watch for a layer of whitish bubbles at the top and skim that off frequently. It is my opinion that an 8 to 12 hour or overnight soaking will be fine on the counter. But… I am saying that a little not sure. 😉 There’s nothing wrong with moving it to the fridge. You’re not fermenting, so the cool shouldn’t interfere. When soaking grains, whether out of or in the fridge, make sure you’re adding an acid medium – yogurt, buttermilk, kefir, whey, Kombucha, etc. – to the soaking water (1 tablespoon per cup). This will not only neutralize the phytic acid, but also suppress putrefying bacteria. However, the last time I soaked beans in whey, they didn’t soften – so I’m not eager to try that again. 😀 For beans, I would just use water for soaking and skim off the scum frequently or move to the fridge if I got worried. Hopefully this will help you. I’d be happy for anyone else to chime in and tell me if I’m waaayyy off – better hear that I’m wrong than you do the wrong thing! .-= gilliebean´s last blog post… Pain, Soft Foods and Protein =-. 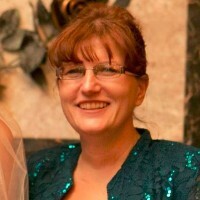 .-= Jen Joyner´s last blog post… Fried potatoes, onions and bacon: Oh my! =-. .-= Alyss´s last blog post… Roly Poly, Daddy’s Little Fatty =-. Alyss – interesting! I’m sure you’re right, especially in hot weather the fermentation action would pick up. Thanks for mentioning that! Wonderful to see you writing about yogurt cheese. We like it so much we wrote a cookbook and guide to expand its uses. I hope you will allow us to share our enthusiasm: Yogurt cheese (or YoChee as we call it) is a wonderful versatile ingredient you can make at home to improve your own yogurt. Simply by draining it. It has substantial health, taste and cooking benefits (a creamy food which is low or no fat plus high protein and calcium). I hope you will take a look at,” Eat Well the YoChee Way” our guide and cookbook to this important food. We even paid ($1,000) to have yogurt cheese analyzed in a lab for nutritional content. The book really increases the use of yogurt cheese to main courses, soups, sauces, desserts, and much more. (Nutritional content included). Inexpensive durable drainers (starting at $9.) make it easy and clean. Our website YoChee.com contains a free yogurt cheese how – to slide show, nutrition information and free recipes. Thanks. Hi there Wardee, I was wondering how long you let your kefir set out to culture when you are using the kefir to make kefir cheese? I generally let my kefir culture for 12-18 hours and it doesn’t really seem thick enough to do cheese with? Should I let it culture for longer than that until it gets to the “curds & whey” point in order to make the cheese? Also, have you tried using kefir to make yogurt with? Wondering how that would work? We use kefir as yogurt, but it is NOT yogurt. It is a completely different culture. .-= Kelly the Kitchen Kop´s last blog post… Julia Child – Cute Clips & Quotes =-. I had to laugh when I read that you put kefir in this! My family always asks before they eat!!! However, I recently made a great potato salad with new potatoes, and I put sauerkraut in it! It was really, really good. Can I just say this recipe JUST hit my potato salad craving for fourth of July? The herbed seasoning I made I am so glad I have too. I didn’t happen to have the kefir but I want to get the stuff to make it because it sounds so wonderfully healthy but I made my yoghurt cheese, and oh I just loved the fresh dill in this. The salad had such a cool crispy taste! Yum and Thank you! Can vanilla yogurt be used instead of plain? I’m going try with whatever we have on hand. Hopefully it works. Thnks for a great recipe. How long will this potato salad last since it is fermented? I can’t eat potatoes. Do you think I could make the same thing with gently-cooked cauliflower? Thanks for posting this recipe !